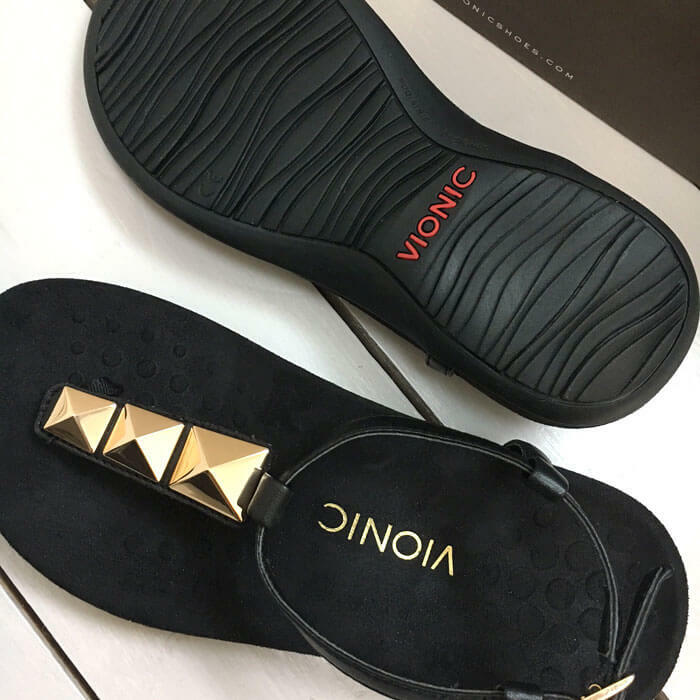 When Vionic asked me if I would like to review a pair of their sandals I didn’t know the brand. A quick look at their website revealed all kinds of science and information about their comfortable shoe technology. I’m a sucker for jargon; words like biomechanical and orthotics are like music to my ears. I previously wrote a post titled ‘women and painful shoes – why do we torture ourselves?’ so this is a subject close to my heart. I chose a stylish sandal called Nala and they arrived a few weeks later. Unfortunately March in London proved too cold for a test run so here I am, reporting back, after our first warm week of spring. I chose Nala in black, they also come in white, gold and red. After painting my toe nails I strode out with my dog Ricci. I walked to work, to the park and back at lunchtime and home again in the evening. I did about 4 miles. The sculpted soles felt good. In particular the embossed spots on the footbed seemed to massage the soles of my feet. They felt light and really didn’t feel like new shoes – except for the thong between my toes. To be fair it happens to me every year. When that area of winter-softened skin is exposed to activity it always takes a few outings to harden up. I should have been less ambitious. Vionic call it FMT technology – but what exactly is it? They use biomechanical research to inform the design of their shoes in order to support and align the foot. Many of the problems we encounter with foot, knee and back pain, especially as we age, are the result of problems with the way we walk. Vionic have taken the science of orthotics (special insoles to correct alignment and gait) and built this into the shoe itself. The result is a firm but flexible footbed which is sculpted to provide support and stability for the foot and relief from pain. Plantar fasciitis is an inflammation of the foot tissue which results in a sharp pain in the centre of the heel. It can develop if the foot rolls inwards when we walk. It is a common problem and can be caused by pregnancy, carrying too much weight or even wearing the wrong footwear. Vionic claim their shoes provide the kind of pain relief normally associated with clinical devices for this type of complaint. Of course the big difference is that they combine the best of science with styles we might actually want to wear. It used to be that comfortable footwear was frumpy; an infinite variety of sensible shoes in brown or beige. I have spent many a christmas listening to my mother and mother-in-law discussing their feet and comparing footwear. I was unfamiliar with their woes and unaware that the structural design of shoes could have a positive effect on our wellbeing. Then along came MBTs and Fitflops. A whole generation of midlife women were hooked on comfortable shoe technology and the promise of longer, leaner legs. I’ve been through countless pairs and my legs are in better shape. The more you walk the fitter you become. It might all sound too good to be true but actually it’s quite simple. Walking is a great exercise so the more you can do, pain free, the better. The best thing about these Nala sandals is that they don’t compromise on style at all. I absolutely love the way they look and they will work perfectly with this summer’s florals and stripes. On the website there are loads of styles that I would wear – including a great range of trainers and a pair of leopard print sneakers to die for. Not all the styles are to my taste but there is something to suit everyone including men. 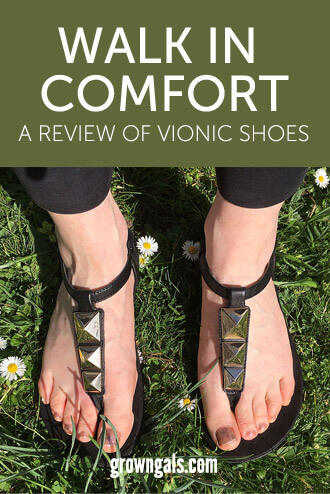 What’s more Vionic shoes are so confident in their product they offer a 30-day refund policy so if they don’t provide the support and pain relief you need you can return them. Ricci poses in just the right spot! Any of you who regularly read my posts will realise that I’m not really a reviewing kind of girl – I am never going to be a beauty or fashion blogger! However I do think that brands which help us to live healthier lives are a good thing. I hope to be walking (and dancing) for decades to come and I’m going to make sure my feet get all the help need. Comfortable shoe technology seems to be the future.